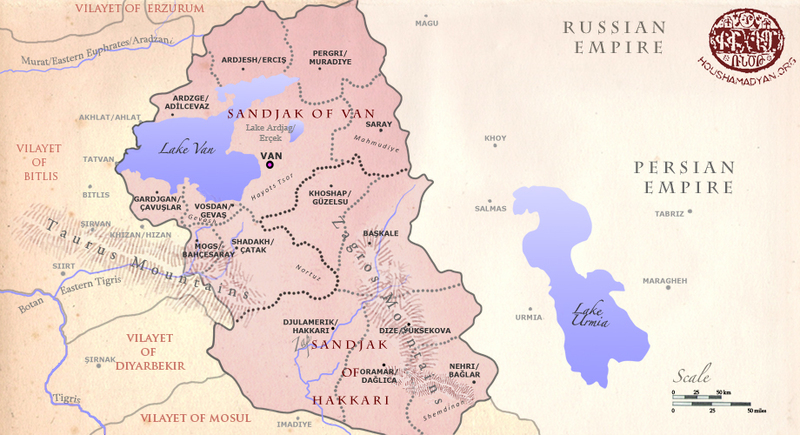 The Van region, or the historic Vasbouragan, is one of the most important cradles in Armenian civilization. There are many age-old traces of Armenian identity and culture in this geographical area. The Armenian entity is an important presence also during the Ottoman years in the city of Van and in the whole region. In other words, during this era, the Armenian stamp is also felt tremendously on the local culture, and on the economic, social, political and religious life. It is a challenge for Houshamadyan to talk about the Armenian heritage in the Van region during the Ottoman years. In fact, there are many Armenian primary sources regarding this subject; however, these remain dispersed in printed books, journals, and periodicals published starting the 19th century. It is necessary to assemble and study these various and often also rare materials, in order to be able to authentically present the multifaceted Armenian life within the Van region in our articles. “Heaven in the sky, Van on earth,” Armenians of Van have many such expressions about their city and region. In the Houshamadyan pages, we’ll try to tackle the various aspects of this paradisiacal beauty and paradisiacal life. We will also address the sad pages of the eras that interest us, which eventually gave way to an infernal end to the local age-old Armenian life.